Successfully starting a new business venture depends upon more than having a brilliant idea, getting funding, and getting the product or service to market. Entrepreneurs must also learn to read the market and understand the environments in which they must operate. Entrepreneurial Opportunity places the emphasis on reading and making the most of things that may be beyond the entrepreneur’s control, from defaulting contractors to the opening and closing of business niches. It also considers previously under-considered options, such as "the political entrepreneur." This long over-due text provides a far more realistic view of entrepreneurial opportunity and the importance of the business environment. Yet despite its realist stance, the book is decidedly optimistic, showing readers how markets evolve over time and present opportunities through that evolution. 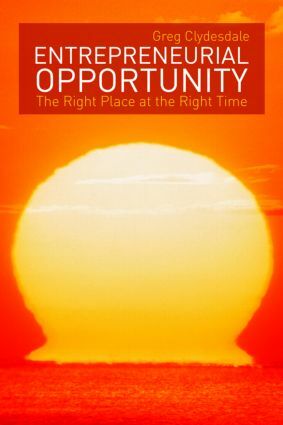 As Clydesdale states, "it’s not always fair out there," but this book captures the excitement of the market and its role in delivering opportunities. Drawing on a broad range of academic research, Entrepreneurial Opportunity is written in a manner that is accessible for students and practitioners, with examples and mini-cases from a variety of industries, including high technology, hospitality, and motion pictures. If You’re Such a Genius, Why Aren’t You Rich? What Type of Entrepreneur Should I Be?